Arguably the most beloved golf course in the entire world, Pebble Beach® is an integral part of the history of the game, having seen the rise and fall of many of the game’s greatest players. This epic track has already played host to five U.S. Opens and a PGA Championship, with two further U.S. Opens scheduled in the next ten years. The fan-favourite AT&T Pebble Beach Pro-Am is also played upon the legendary links every year. Pebble Beach is located on the Monterey Peninsula on the west coast of California, making getting there a breeze, you can fly direct into San Francisco or San Jose International Airport which are 2-hours and 90-minutes away respectively. Remember, the only way you can pre-book tee times at Pebble Beach Golf Links™, Spyglass Hill® and The Links at Spanish Bay™, is by staying at The Lodge at Pebble Beach™or The Inn at Spanish Bay™, luckily, both provide fantastic accommodation options. Simply put, if you are in California, Pebble Beach is a must-play that you will be talking about for years to come. In 1919, Jack Neville and Douglas Grant set about creating a golf course that vindicated its position perched on the cliff tops overlooking the Pacific Ocean. While this pioneering duo laid the foundations of Pebble Beach, it was one Henry Chandler Egan who sculpted the course largely into its current shape. The course opens in a subdued and understated fashion, easing you into the round and preparing you for the adrenaline rush to come, with a sub-current of tension and drama palpable for every visiting golfer. From the 6th, where the golf course begins to meander along the dramatic cliff-side, Pebble comes into its own and it’s easy to see why it enjoys such an iconic reputation. The views from the course are simply incredible – you might even catch a glimpse of humpback whales depending on the season – and the golfer is asked plenty of questions, particularly on the seaside holes. The greens in general are very small and well protected so the key to scoring well can often lie in the accuracy of your approach shots; that and being able to ignore the beauty of the Monterey Peninsula and concentrate on the task in hand! There’s a grand sense of history here too and on your way around the course, you can’t help but think of the greats of the game whose footsteps you’re following in. Channelling your inner Jack Nicklaus, Tom Watson or Tiger Woods makes the experience all the more magical. Pebble Beach is the ultimate once-in-a-lifetime golf course, so if you happen to get a chance, be sure to grasp it. Picturesque yet perilous, the closing hole at Pebble Beach is one of the world’s most famous par 5s. The hole hugs the Pacific coastline, gently sweeping round to the left, and yet from the tee at least, it seems the hole is quite a dramatic dogleg. Golfers playing from the back sticks must tee off over the rocks and the crashing waves, and from the fairway, long hitters will be able to have a crack at the green in two. With the ocean to the left and bunkers in play around the green though; laying up is often the best strategy. If you’re unsure about your putt, just remember they tend to break towards the water! The Pebble Beach Golf Academy & Practice Facility is one of the finest in the USA. Improve your game at the 3,000 sq foot learning centre where coaching staff can make use of three instruction studios that feature all the latest technology including 3D Motion Capture Analysis, HD Video and a Golf Simulator. Practice facilities include a 350-yard, double-ended driving range with natural grass hitting area, a 4,500-square-foot practice putting green and a comprehensive short-game practice complex with bunkers and chipping areas. Open to Pebble Beach members and guests of Pebble Beach Resorts, the Beach Club is an amazing place to enjoy a bite to eat or indeed a few well deserved drinks before or after your game. Take a short stroll from The Lodge at Pebble Beach and enjoy amazing views out over Stillwater Cove, Carmel Bay and the 17th fairway. 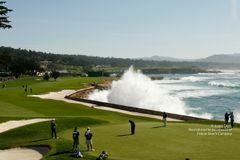 While the weather in California is commonly ideally suited for golf, Pebble Beach’s coastal location means it can change in a heartbeat. You probably won’t need them, but pack waterproofs if you have the space. With arguably the finest stretch of holes anywhere in the world between the 6th tee and the 10th green, packing a camera is also advised. Golf Buggies are available but with the infinite beauty of the course and its surroundings in mind, we’d advise taking your time and walking the course if you can manage it. There is a caddie service too, so you don’t even have to carry your clubs if you don’t want to!